This adorable little stuffed elephant from the Handfuls collection is ready for hours of fun and imaginative play. 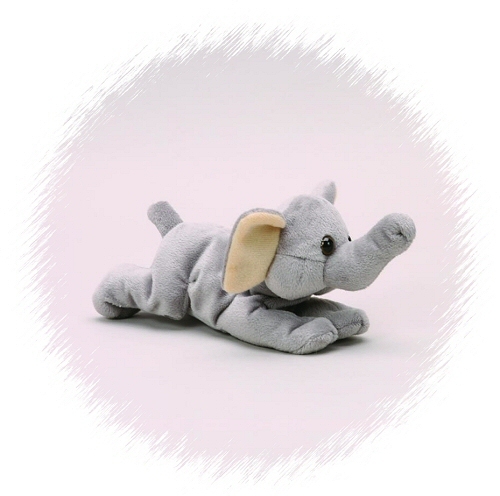 With soft gray fur, floppy ears, and a sweet face, this plush elephant is the perfect size for take-along adventure. After all, stuffed elephants thrive on fun and companionship. Ellie, this adorable little Mini Flopsies stuffed elephant, has wonderfully soft gray fur, fun floppy ears, light pink inner ears, and a sweet face. Light blue fur filled with blue-raspberry colored hearts covers the soft and huggable body of this Sweet & Sassy Elephant.